Namibia offers a wide variety of walks, overnight hiking trails and guided wilderness trails for those wanting to explore the countryside on foot. The 18-km Jakkalsputz Walking Trail starts at the southern end of Henties Bay from the Gallows and ends at Jakkalsputz. The route is unmarked, but you can’t lose your way if you follow the beach southwards to Solitude Bay in the direction of the Jakkalsputz camping site. For the more energetic there are the 20-km and 70-km Omaruru River Walking Trails, both quite strenuous and best done on a cool day when it is overcast. Named after the wild horses of the Namib that roam the desert plains to the west of Klein-Aus Vista, several hiking routes traverse the rugged Aus Mountains located in the Gondwana Sperrgebiet Rand Park. There are five different hiking trails to choose from: the Sunset Walk (1 hour, easy), Schutztruppe Trail (3 hours, easy), Mountain Trail (2 hours, easy), Geister Trail (4 hours, for experienced hikers) and Eagle Trail (5 hours, for experienced hikers). 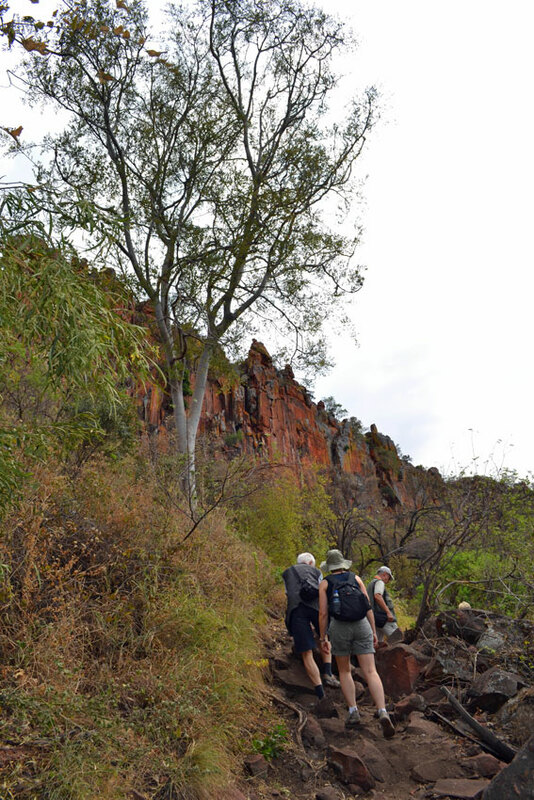 Klein-Aus Vista also offers a guided hiking tour, the Dikke Willem Trail (1 day, maximum 10 participants, for experienced hikers) to the top of a geologically interesting inselberg (1 500 m). One of the major hiking trails in Southern Africa, the Fish River Canyon Hiking Trail takes backpackers on a journey along one of the largest canyons in the world. Hemmed in by sheer canyon walls towering as much as 549 metres above the meandering river, the trail runs between the northern-most viewpoint of the Fish River Canyon and the thermal hot spring at the /Ai-/Ais Spa. The trail is 85 km long, is self-guided and usually takes four to five days. The park can be explored along several interesting walks and an overnight trail. The Naukluft Hiking Trail takes hikers- to secluded valleys with hidden pools, past sheer cliffs and across undulating hills. The trail is 120 km long and has eight-, four- and two-day options. In the Naukluft section of the park are two rewarding day hikes, the 10-km Olive Trail and the more demanding Waterkloof Trail, which covers 17 km and takes between six and seven hours to complete. 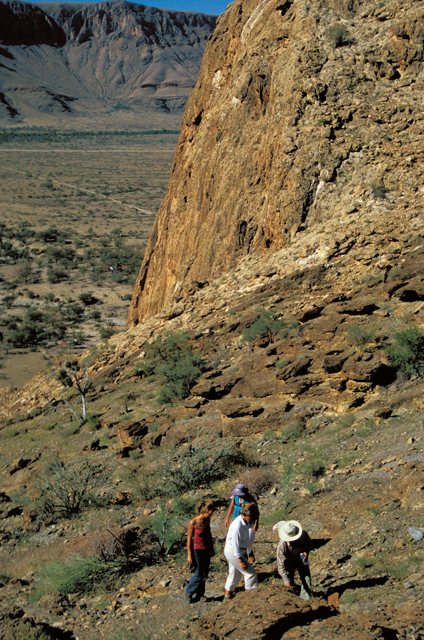 The Quiver Tree Gorge Trail is offered by BüllsPort Guest Farm for hikers who do not want to hike the full day. 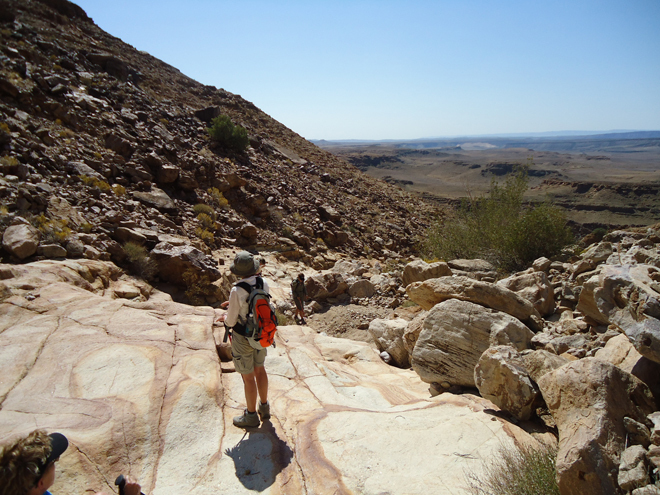 The Namib section of the park offers the Rock Sculpture Trail, which can be completed in three hours, and the Tinkas Nature Walk, which takes four to five hours. The owners of the Ababis and BüllsPort guest farms joined forces a few years ago to create the NAUKLUFTexperience and develop a hiking trail on Zipfelberg in the Naukluft. 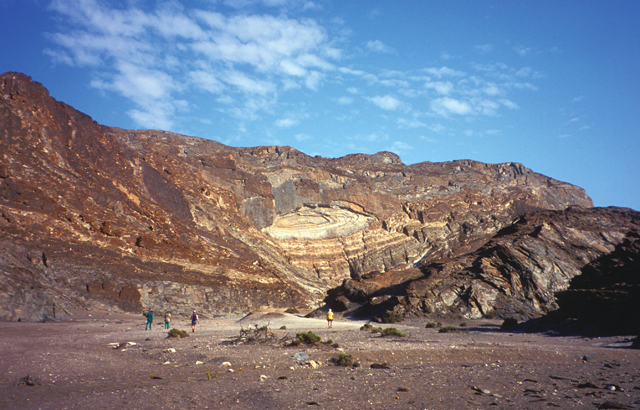 Visitors frequently pass through Naukluft, one of Namibia’s most spectacular mountain massifs, on their way to Sossusvlei, making use of the guest farms merely as stopovers, unaware of Naukluft’s potential. Also called the Eight Day Trail, this 120-kilometre trail is regarded by seasoned hikers as one of Africa’s toughest hiking- challenges. Routes are along dry river-beds alive with brightly co-lour-ed birds darting in and out of prickly acacia trees; mountainous and winding zebra paths; a tough climb up Heartbreak Pass, dotted with zebra carcasses; and from 300 metres below the plateau, the unforgettable reward of the panoramic vistas of the Naukluft spreading to infinity. Ugab area. Photo: Luise Hoffmann. For keen, self-sufficient hi–kers- there is a two-night, three-day hiking trail, guided by one of the Nature Conservation rangers, to explore the Ugab River in depth. The trail covers a total of about 50 km, reaching as far inland as the foothills of the escarpment where there are natural springs. On this trail the possibility of a face-to-face encounter with a black rhino or a buffalo is very real. Seeing a fresh rhino track on the trail is guaranteed to get the adrenalin going. The route is 50 km and takes four days to complete.